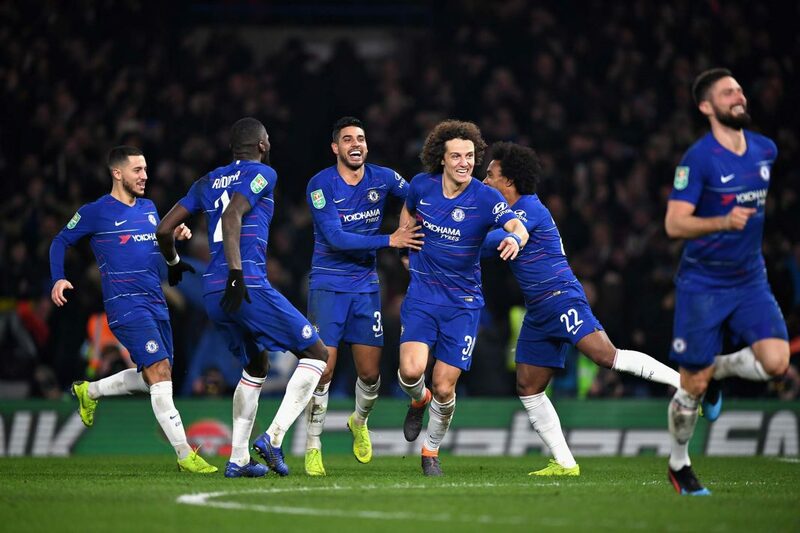 David Luiz celebrates after scoring the winning penalty during the Carabao Cup Semi-Final Second Leg match between Chelsea and Tottenham Hotspur at Stamford Bridge on January 24, 2019 in London. Arsenal 2 Chelsea 0: I was all ready to blog from the novelty of 40,000 feet, somewhere over Europe on a 283 degree heading on an Emirates A380-800. For they show live football. Huzzah. The downside? The coverage included Ian Wright. Bearer of the pettiest, loudest and most grammatically incorrectly articulated grudge in football because we sold his stepson. Surely being able to speak in proper English should be a prerequisite for television. The two small people who had been balling every since our second plane departed Dubai five hours before actually displayed more maturity, and made more sense. And I wanted to smother them less. So this was the version of Chelsea that turned up for this one. God help me now I could hear two screaming brats and smug Gooners in stereo. High balls into the box for players almost as short as me, all the impetus of Sam Allardyce on a treadmill and we still looked sadly fragile when they broke. Then it was two. And I decided to invest as much in this game as Chelsea and switched it off to watch the camera taped to the underside of the plane approach the runway at Gatwick. Not a single shot on target did I miss as a result. In the entire game. Then there was the thoroughly Chelsea fallout of a manager complaining about his players to the press. Classy. No, it’s not all your fault, but your high seven-figure salary surely puts motivating personnel somewhere in your remit. Much like having a Plan B. On the outgoing side, Cesc made an emotional goodbye speech in the dressing room before bidding England goodbye to go and join Henry at Monaco. Then Henry got fired. Considering his last ditch attempt to save his skin was to try and Fail-lani on loan it is hardly surprising, is it? Bayern still won’t f*ck off re Hudson-Odoi. To the extent that we are considering reporting them for tapping up. They’ve apparently offered him a “staggering 85k a week.” Not staggering by Chelsea standards. If the club wanted to keep him, they would match that without a second thought. Which apparently they have and he has turned it down. Sigh. So: Emerson deserves to keep his spot. Well done Barkley. What a shame RLC has been injured for this run of fixtures. Sp*rs have now failed to progress in five of their last six semi-finals. Three of them against us. Happy days. Higuain has made more finals in six hours of being in England than any of them in the last decade. “Injury hit” they’ve called them in every match report. You haven’t got your main striker? Ours has been AWOL for about a year. We named Lucas Piazon on the bench. I’d forgotten he even existed. Get out of it you Sp*rsy, lightweight chumps. Let’s hope that none of the delay on the new stadium has been because they’ve been installing a trophy cabinet.